Pre-Set pressurized system for $1,000, or anywhere in between. Below we are starting at the lowest price system and moving up to the highest. SCHRADER VALVES "Poor Man's" Air-management system. Add an on-board compressor for as little as $59, and air all 4-Corners up/down on demand, or add a variety of switches,tanks, or valves for a low cost system. They also Serve as test valves when checking install travel on bags and emergencies to fill bags. Available in 150psi and 200psi, these gauges will fit any of our bezels and gauge pods. Also available is the Mini-Gauge, perfect for multiple gauge clusters or smaller applications like Motorcycles. Controls one axle for up/down. Just run 1/4"
airline from the back of the gauge used primarily for economy Towing Kits. You will need to select a Compressor from the Options shown at the bottom of this page. MINATURE PUSH-BUTTON VALVES Controls two Airbags independently for up/down. Just run 1/4" airline from the back of the gauge. Gauge has dual needles. Used primarily for economy Towing Kits to control bag pressures separately. You will need to select a Compressor from the Options shown at the bottom of this page. MINATURE PUSH-BUTTON VALVES Complete FBSS Controls each Airbag independently up/down. Just run 1/4" airline from the back of the gauge. Gauge has dual needles. Your vehicle will still move up/down withing 5 seconds. You will need to select a Compressor from the Options shown at the bottom of page. ELECTRIC DUAL NEEDLE FBSS Complete FBSS Controls each Airbag independently up/down. Just snap the wiring harness in and wire the valves with the included Wiring Harness. You will need to select a Compressor and Airtank from the Options shown at the bottom of page. 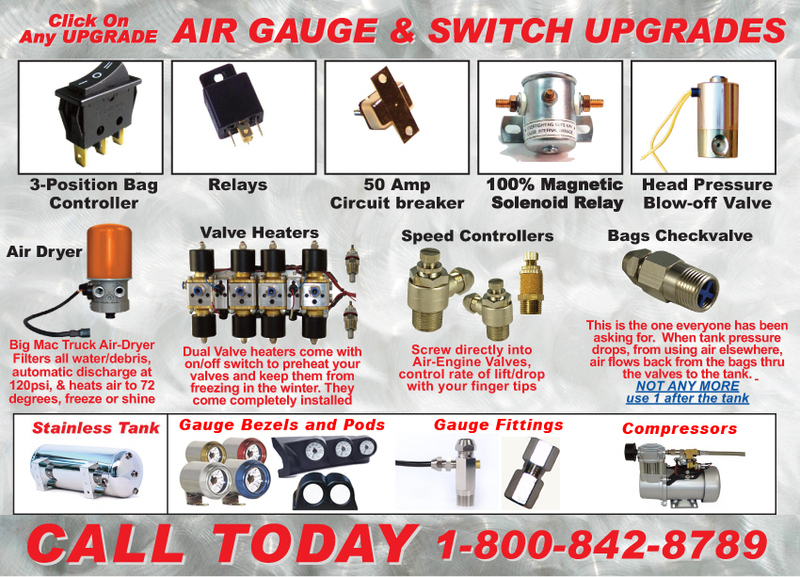 Everything we sell is prewired and plumbed for you, just as shown. 8-Brass Valve Air-Engine with Compression Fittings and Wiring Harness, plugs into back of 2 Dual Gauges, then tank. All Pre-Installed. Nothing to Wire or Plumb. Save about 2 days on your install time. Built by the factory that builds Parker and SMC. Lifetime Warranty on Valves & Compressor for Defects. No Limit to time.